205 pages | 11 B/W Illus. Some have estimated that healthcare fraud in the United States results in losses of approximately $80 billion a year. Although there are many books available that describe how to "detect" healthcare fraud, few address what must be done after the fraud is detected. Filling this need, Charles Piper’s Healthcare Fraud Investigation Guidebook details not only how to detect healthcare fraud, but also how to "investigate" and prove the wrongdoing to increase the likelihood of successful prosecution in court. The book includes a sample case study that walks readers through a mock case—from the time the case is received through the end. The case study demonstrates how to initiate, plan, and conduct a thorough and complete healthcare fraud investigation while incorporating Piper’s proven methodology. Sharing insights gained through Charles Piper’s decades of experience as a federal special agent and certified fraud examiner, the Healthcare Fraud Investigation Guidebook aims to revolutionize the way that healthcare fraud investigations are conducted. It provides the understanding you need to not only put a bandage on the problem of healthcare fraud, but to actually start curing the greed that is poisoning the healthcare industry. "Investigating healthcare fraud is a challenge for both the rookie and experienced investigator. Success requires knowledge of how our healthcare system works and of the broad range of potential fraud schemes unique to healthcare, along with solid investigative techniques and skills. 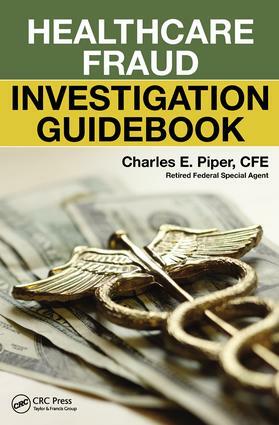 Charles Piper’s excellent book, Healthcare Fraud Investigation Guidebookcovers all of these topics and more, providing investigators with the practical information they need to meet the challenge. A copy of Charles Piper’s Healthcare Fraud Investigation Guidebookshould be on every healthcare fraud investigator’s desk." "Healthcare fraud is so enormous that no one can accurately estimate what the total cost is. And, it costs all of us. Everyone reading this sentence is the victim of healthcare fraud through higher medical fees, increased premiums, and tax hikes. I am grateful that an experienced fraud examiner such as Charles Piper has taken the time to share his extensive knowledge and experience so that others can join him in the fight to reduce this massive epidemic." "Healthcare fraud is costing money and lives. Charles Piper’s Healthcare Fraud Investigation Guidebookexposes the problem and provides tested methods to investigate healthcare shenanigans. ‘The Piper Method’ of conducting thorough and complete investigations needs to become the preventive remedy that cures the greed that is poisoning the healthcare industry." "Whether you are working your first healthcare fraud case, or you are an experienced veteran, the Healthcare Fraud Investigation Guidebookby Charles E. Piper, CFE, will be your lifeline to a thorough, organized, and successful inquiry. Piper shares his decades of expertise to help you identify the fraud schemes and the investigative strategies used to best uncover them. Far more than an introduction to the topic, it is an encyclopedia on how healthcare fraud works, how to get to the bottom of it, and of particular value, how to look for fraud patterns so your investigations might be expanded beyond single providers and other wrongdoers. This book should be required reading for any fraud fighter investigating healthcare fraud." "Charles Piper’s Healthcare Fraud Investigation Guidebookshould be considered the go-to book for investigating healthcare fraud. His shared detailed investigative approach will help investigators to not only identify healthcare fraud, waste, and abuse but to also connect the dots and identify more fraud and more wrongdoers and then make recommendations for improvement to prevent reoccurrences. Piper’s thorough and complete investigative methodology should be the standard practice for all investigators and investigative agencies and organizations. Taxpayers and all who pay insurance premiums will also be delighted that this revolutionary approach is being utilized to help make healthcare more affordable." "I worked closely with Charles Piper when we served as federal agents with the Defense Criminal Investigative Service. He is the consummate professional. Piper’s Healthcare Fraud Investigation Guidebookis a great tool and resource for those responsible for investigating and prosecuting healthcare fraud. I highly recommend it." "Fraud fighter Charles Piper has hit another home run! In his Healthcare Fraud Investigation Guidebook, Piper has successfully dissected what many believe to be the most complicated venue of the investigative discipline. He presents healthcare fraud investigating into concise, easy-to-follow concepts that can be utilized by virtually anyone working in the field of healthcare administration, investigation, and prosecution. I highly recommend this book to all striving to identify and investigate healthcare fraud, waste, and abuse." "Charles Piper worked for me as a Federal Senior Special Agent in Orlando, Florida. He was one of my smartest, most reliable, and hardworking agents. He always had the right investigative approach to identify, prove, and ultimately obtain convictions of his case subjects. The Healthcare Fraud Investigation Guidebookis reflective of Piper’s knowledge and abilities to identify and investigate healthcare fraud. Many professional fraud fighters should benefit from this publication." "Fraud is everywhere, but due to the unique nature of the healthcare industry, it provides even more opportunities for fraudulent actions by those with unscrupulous motives. To fight healthcare fraud, you have to understand what is normal in the business of medicine in order to recognize the abnormal. Charles Piper’s Healthcare Fraud Investigation Guidebookhas succeeded in providing the necessary groundwork as well as guidelines for the requirements that may be needed to successfully investigate various fraud in the healthcare industry." "I had the pleasure of working with Charles Piper, CFE, when we served as Federal Special Agents. He is always meticulous and persevering to dig out the truth. Piper’s Healthcare Fraud Investigation Guidebookis filled with details on the many types of healthcare fraud schemes and his shared real-life war stories are from the realities of the trenches. This book is a very useful tool for anyone investigating healthcare fraud." "Having worked with Charles Piper, I know he conducts investigations with enthusiasm and passion. That same approach is shared in his latest book, Healthcare Fraud Investigation Guidebook. It is a must-read for those conducting healthcare fraud investigations." "Charles Piper has done it again! His Healthcare Fraud Investigation Guidebookis the complete 1, 2, 3 … A to Z guide on how to conduct healthcare fraud investigations. This book should be on every healthcare fraud investigator’s desk." "Healthcare fraud is not just conducted by providers but cuts across multiple disciplines, including individuals, insurance providers, and hospitals. Charles Piper’s Healthcare Fraud Investigation Guidebookprovides an excellent focus on healthcare fraud and includes detailed examples and investigative guidance that healthcare investigators and auditors will greatly appreciate." "Having spent a career investigating fraud both within and beyond healthcare contexts, two things were crystal clear after reading Charles Piper’s latest book, Healthcare Fraud Investigation Guidebook. First, Piper possesses significant fraud investigative experience, and a well-developed approach to fraud investigations. Second, his understanding of healthcare fraud is likely at a level few have attained in their careers. Consistent with his first book, Investigator and Fraud Fighter Guidebook: Operation War Stories, Piper uses his experience to teach the reader, starting with explaining the basics and terminology, up through planning and completing an entire fraud investigation, all the while weaving in first-hand examples of his fraud cases throughout the lessons. This is a must-read book for anyone investigating fraud within healthcare contexts." Preface. Acknowledgements. About the Author. BACKGROUND ON HEALTHCARE INSURANCE & RELATED FRAUD. TWENTY COMMON HEALTHCARE PROVIDER FRAUD SCHEMES. OTHER HEALTHCARE FRAUDSTERS & SCHEMES. VICTIMS, INVESTIGATORS, COMPLAINANTS, LAWS & STATUTES. CODES, NUMBERS, FORMS & DOCUMENTS. INVESTIGATIVE SOURCES & RESOURCES. INVESTIGATIVE TOOLS & TECHNIQUES. INTERVIEWS & INTERROGATIONS. INVESTIGATIVE REPORTS & EVIDENCE. INVESTIGATIVE CASE PLANNING, GOALS & STRATEGY. CASE PRESENTATIONS & TESTIFYING. POST ADJUDICATIVE ACTION. SAMPLE CASE STUDY UTILIZING THE "PIPER METHOD". Conclusion. Samples (Slides) of Case Presentation Visual Aids. Charles E. Piper, CFE, CRT, is an award-winning investigator and author. He served for more than 30 years in law enforcement, including 20 years as a special agent–criminal investigator with the Department of Defense, where he conducted major fraud investigations from coast to coast. Piper has investigated numerous healthcare providers and others for fraud and worked jointly with federal special agents from the FBI and the many Offices of Inspector General. His investigations have resulted in millions of dollars in recoveries and criminal convictions and civil judgments against fraudsters. He is also a proud veteran of the U.S. Army. Piper is currently the owner of Charles Piper’s Professional Services in West Tennessee, which provides investigative, consulting, and training services. He is a Certified Fraud Examiner (CFE), Certified in the Reid Technique of Interview and Interrogation (CRT), and a graduate of three law enforcement investigative academies (federal, state, and military). Piper has received numerous awards and recognition while serving in law enforcement, including Special Agent of the Year. Since opening his own company, Piper was the recipient of the 2014 Association of Certified Fraud Examiners’ (ACFE) Hubbard Award. He has written several antifraud and investigative articles for the ACFE’s Fraud Magazine and other publications.